If a beer is to your tastes does it matter if it's 'to style'? I wrote recently about how much I liked the branding of this beer and the idea behind it. But what does it taste like? Well it tastes very good, but I'm not sure it's a black IPA like that wonderful label would suggest. But does that matter? The aroma is hot black irish coffee and sweet, boozy orange liqueur. 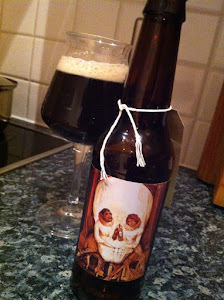 Quite a lot of alcohol in the aroma but it smells good, though not the most floral 'black IPA' I've ever smelt. And therein lies the slight problem for me. Yes the taste is a big beautifully bitter porter, but for me it lacks the fruity hop flavour that makes the best black ipas really sing. Its also not too heavy in the body and with that clean and bitter finish it drinks way below its weight and is gone before you know it. So honestly, stylistic geekery aside, this is a lovely beer which opens up to reveal loads of rich coffee flavours spiked by leather, tobacco, and a dry white pepper finish. Which in itself is interesting enough. So does it matter if it isn't really a true to style 'black IPA'? (whatever the hell that is). My vote is for no. My only qualm is if a beer is labeled some sort of IPA, and I'm really in the mood for an IPA, yet it tastes not what I was expecting. But such is life, good beer is good beer, no matter if it's "to style!" As long as you're not deceiving customers it's fine. Beer styles are pretty vague anyway. I think they should be.